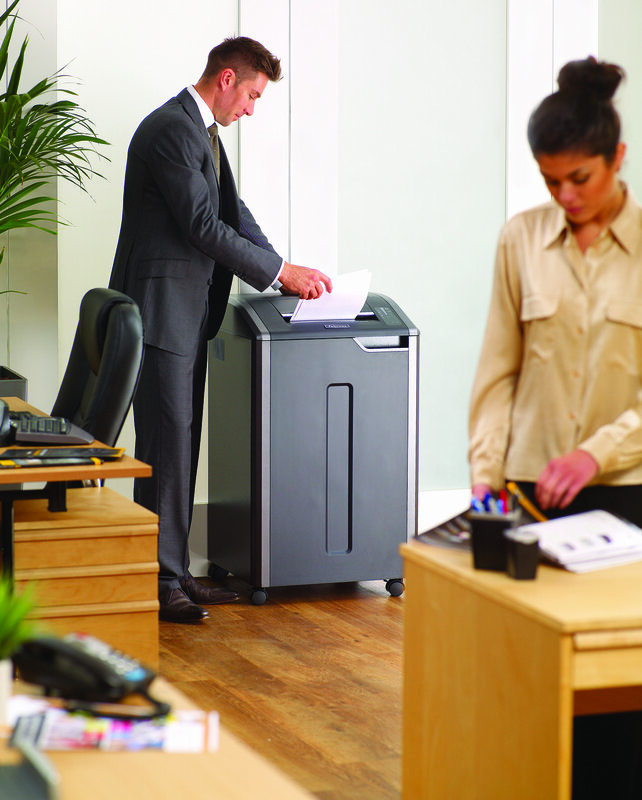 Fellowes Powershred 485Ci Cross Cut Shredder is a principal office shredder available in the market. This Fellowes Powershred 485Ci Cross Cut Shredder paper shredder comes equipped with unparalleled features that make Fellowes Powershred 485Ci Cross Cut Shredder the primary choice for businesses around the world. With a cut size of 5/32” x 1 1/8”, it makes reproduction of shredder data impossible and protects the confidentiality of the documents. The Powershred 485Ci has a feed opening of 16” and a shredding speed of 20 ft/min. Fellowes Powershred 485Ci Cross Cut Shredder’S powerful cutters, can easily shred paper clips, staples, credit cards and DVDs, and are backed by a lifetime warranty from Fellowes. The excellent condition of the cutting blades is maintained by 485Ci’s automatic oiling feature which lubricates the cutting shafts at regular intervals. The design of this Fellowes Powershred 485Ci Cross Cut Shredder paper shredder also incorporates a waste bin on Fellowes Powershred 485Ci Cross Cut Shredder of 35 gallons which can be easily accessed from the front cabinet. The Powershred 485Ci Cross Cut shredder comes with the best protection against operational accidents. Fellowes Powershred 485Ci Cross Cut Shredder’s Safesence technology comes with electronic safety sensors that stop the shredder if the user’s of Fellowes Powershred 485Ci Cross Cut Shredder hands are close to the feed opening. The three stage technology of Fellowes 485Ci makes paper jam impossible, resulting in a hassle free shredding experience for the users. The patented ultra quiet feature of Fellowes PS 485Ci operates the machine on the lowest sound levels, making this shredder an ideal choice for any office as Fellowes Powershred 485Ci Cross Cut Shredder allows the user to carry on the shredding operation without any disturbances. The Fellowes Powershred 485Ci Cross Cut paper shredder also features an energy saving system that reduces power consumption at all times, making it economical and environment friendly. Fellowes Powershred 485Ci Cross Cut Shredder is known for its office use and Fellowes Powershred 485Ci Cross Cut Shredder one of the best options amongst all the shredders present in the market. Sheet capacity sensors present doesn’t let the Fellowes Powershred 485Ci Cross Cut shredder to stop its operations if any paper jams occur. Safety shield equipped with electronic sensors and whenever shield is lifted these sensors present within the Fellowes Powershred 485Ci Cross Cut Shredder prevents anything other than paper from entering the feed. Auto shut off feature doesn’t let the Fellowes Powershred 485Ci Cross Cut Shredder Shredder to consume excessive energy, when remained in active for 30 minutes. Fellowes Powershred 485Ci Cross Cut Shredder works silently without making any disturbance while Fellowes Powershred 485Ci Cross Cut Shredder is working. Fellowes Powershred 485Ci Cross Cut Shredder mobility is made easy by mounting it on casters and Fellowes Powershred 485Ci Cross Cut Shredder is designed in a way which could be fitted in any place making Fellowes Powershred 485Ci Cross Cut Shredder more suitable for office use. Experiance sleek design, innovative technologies and hassle free shredding with the powershred 425 and 485 series of cross cut and strip cut shredders. Each of these four commercial models are proudly designed and assembled in the USA and meet strict TAA guidelines. The 28 sheet crosscut and 38 sheet strip cut models all have continuous run times and power through CDs, DVDs, credit cards, paperclips, staples and junk mail. The 425 series features a 12 inch throat, inconvenient 30 gallon removable waste bin. While the 485 series features an extra wide 16 inch throat and larger 35 gallon waste bin. Both crosscut shredder features our auto oil system which automatically lubricates the cutters to enhance performance and extend shredder life. Paper jams are no longer frustration with the fellows 425 and 485 series shredders. Our advanced 100% jam proof system will not only prevent the shredder from being overfed but also manages miss fed paper by pausing the motor, reversing out the paper and then powering through the tough job. Just watch the light bar to maximize productivity. Green to yellow gives you the feedback that you are shredding within the recommended capacity. While red means you're over the sheet limit. Safety also counts with the 425 and 485 series, our advanced safe Sense technology automatically stops shredding when hands touch the paper opening. 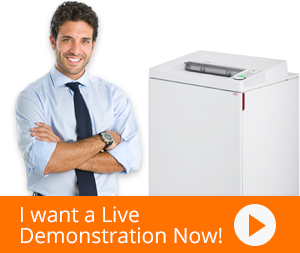 These shredders also feature our exclusive energy saving system optimizing energy savings both in and out of use. Experience innovation, power and durability with fellowes, the world's toughest shredders. Q. How fine are the particles made with this shredder? A. The 485Ci shredder cross cuts paper into 4x30 mm pieces. Q. What happens if I leave the machine on for some time? A. When left unused for some time, the machine reverts to standby mode to minimize the use of electricity. Q. What kind of maintenance do I need to do? A. Very basic. Mostly the auto-oil feature ensures that the machine is lubricated at all times. Q. In what colors is the 485Ci available? Q. Is this a continuous machine? A. No, you need to allow it to rest after 60 minutes of use.